The Bay Area is a safe area. Three Bay Area cities rank among the top 10 safest, led by Sunnyvale at number one. In general, cities in the Bay Area have low violent crime rates, low rates of drug use and relatively low rates of deadly traffic accidents. Texas too. 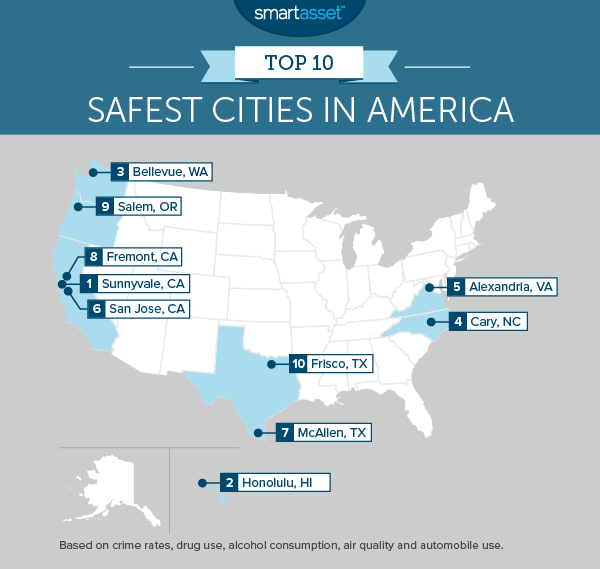 Three of the top 11 safest U.S. cities and five of the top 25 are located in Texas. Places like McAllen and Frisco have some of the lowest violent crime rates in the U.S. The Northeast rates poorly. Zero cities in the northeast rank among the nation’s safest. In fact, SmartAsset’s analysis found that the safest city in the Northeast is Yonkers, New York, which ranked just 29th overall. 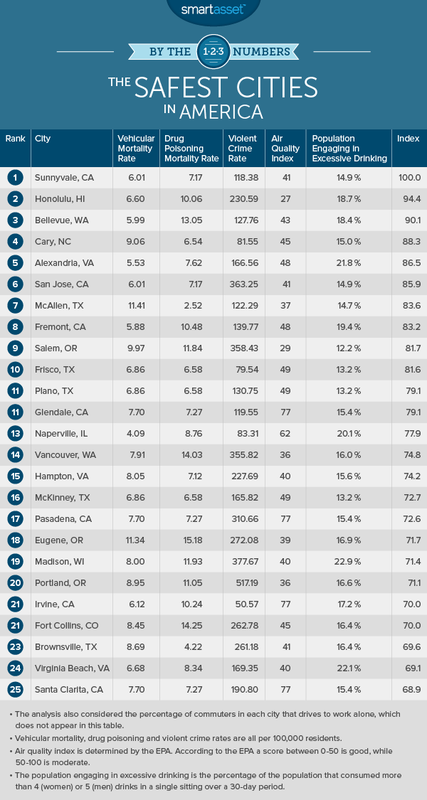 Located in the heart of Silicon Valley, Sunnyvale rates as the safest city in America. The violent crime rate in the city is well below average, but that’s not the only reason Sunnyvale is so safe. It is located in Santa Clara County, which is served by the Valley Transit Authority and has a vehicular mortality rate less than a third the national average. It also has one of the lowest rates of drug use of any county in the country. Island living is safe living. Honolulu has a violent crime rate of just 230 per 100,000 residents annually. Residents of the city also stay safe by staying out of their cars. 12% take public transportation to work, while another 11% either walk or ride a bike. Just 56% drive to work alone. Located across Lake Washington from the city of Seattle, Bellevue has grown rapidly in recent years, adding 14,000 new residents between 2010 and 2014. That equals an annual population growth rate of 2.7%, among the highest in the U.S. over that period. That kind of growth presents challenges when it comes to maintaining public safety, but Bellevue has largely been unaffected. Of the 200 largest cities in the country, Bellevue’s violent crime rate is 22nd lowest. Relocating? Find out what your commute will be. Frisco is a city of 145,000 residents located about 30 miles north of Dallas. It has the fourth-lowest violent crime rate of any major U.S. city with just 80 violent crimes per 100,000 residents. Population engaging in excessive drinking. The percentage of the population that consumed more than 4 (women) or 5 (men) drinks of alcohol on a single occasion over a 30-day period. Air Quality Index. A measure of particulate matter, ozone and other forms of air pollution calculated by the EPA. Air pollution is a factor for many of the country’s most deadly medical conditions. After collecting data on these six metrics, we ranked each city according to each metric. We then averaged those rankings. We gave double weight to each city’s violent crime rate, while giving half weight to each city’s drug poisoning mortality rate and excessive drinking rate. Data on violent crime rates comes from the FBI’s Uniform Crime Reporting Program and from local police department and city websites. Data on the vehicular mortality rate, the drug poisoning mortality rate and the population engaging in excessive drinking comes from countyhealthrankings.org. Data on the air quality index comes from the Environmental Protection Agency. Data on the percentage of commuters who drive to work alone comes from the U.S. Census Bureau. If you are moving to a new place, it’s a good idea to understand how the change will impact your budget. SmartAsset’s paycheck calculator can help you determine how living in your new home will impact your take-home pay.